In a large bowl, combine flour, salt, dry yeast, sugar .then add oil to the mixer. Add an egg and mix it. Then add warm milk and start kneading using your hands .Cover bowl with plastic wrap; let stand in a warm place for 1 hour or until dough has doubled in size. Heat the pan; add butter and ¼ cup onion.fry onion till soft. Then add chicken, salt, ginger and garlic paste, black pepper and garam masala powder. Cook them for 10 minutes on medium heat. Add capsicum, tomato sauce and soya sauce and cook for another 2 min. make sure that the mixture is completely dry. Finally, add green chilies and switch off the heat. Add some mayonnaise, sauce and salads with chicken. Set aside. Take the dough and knead the dough for 5 mins. Divide them into ball size (12 balls). Then cover them well with aluminum foil, so that no paper shows. Brush some oil over the cones. Take each ball and roll into a 20 inch rope. 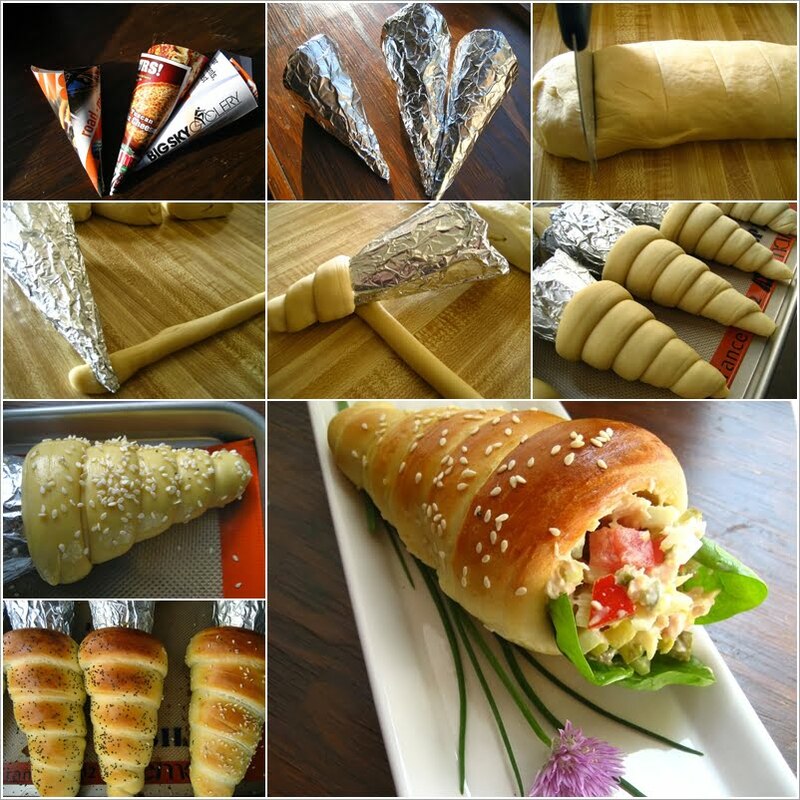 Roll each dough ropes around the cones. Place them into greased baking tray .Brush the egg yolk and sprinkle some sesame seeds on top. Let it prove for another 10 min. 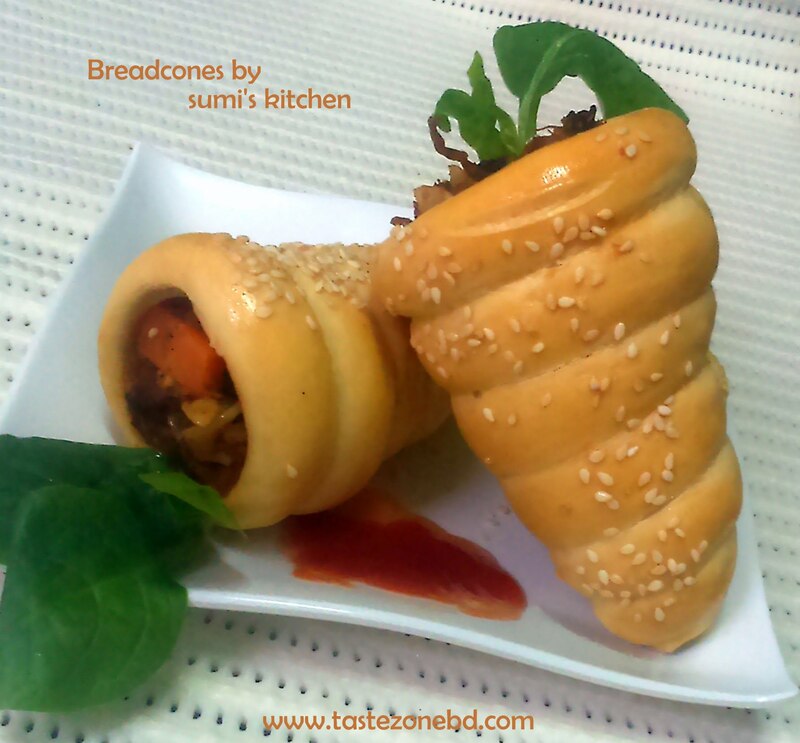 Bake them in a pre-heated oven at 190C for 20 min. Let them cool and then fill them with filling.